It's clearly been ripped and placed back together unevenly. If you read the first part of the script from the line below it makes perfect sense. I got quite a kick out of that though. Amazing! I don't know if it's apocryphal, but i always heard tell (from Richard Wall) that this review appeared in some sort of TV Guide when they first showed the movie on TV: "A young woman is transported to a surreal land where she kills the first woman she meets. She befreinds 3 total strangers and goes on to kill once more...."
All right, Kenneth, you sly fox, you, I've uncovered the key to your bizarre President's Day joke... the words on the right side of the tear in the label are one line off from the left side. 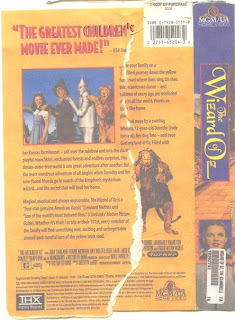 So the first part of the label actually reads, “Take your family on a fun-filled journey down the yellow brick road where lions sing, tin men talk, scarecrows dance – and children of every age are reminded that in all the world, there’s no place like home. Whisked away by a swirling tornado, 12-year-old Dorothy (Judy Garland), her dog Toto – and even her Kansas farmhouse! – sail over the rainbow and into the dazzling land of Oz. Filled with playful munchkins, enchanted forests and endless surprises, this dream-come-true world is one adventure after another, etc.” But it is a more entertaining read in your version! The box was ripped, and taped back together - badly. I rented it from some crappy brooklyn video store. the way the lines had been pasted back together came out as presented here. You can see that the paragraphs are just misaligned. but it was still hilarious.